Jose Mourinho's time at United looks to be coming to an end. There are rumours circulating that if he loses a must-win game against Burnley on Sunday, then he will be relieved of his managerial duties. To quite a few United fans, that will be a relief. 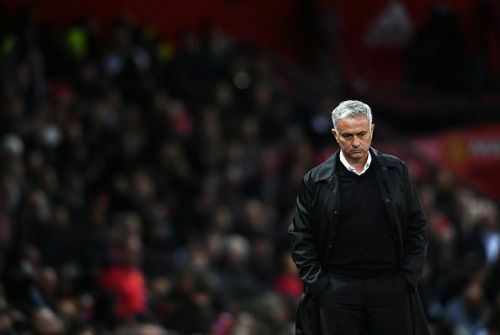 However, most football observers know that the writing has been on the wall for Mourinho for some time now, possibly ever since he took charge of United. Put simply, he's never looked comfortable when managing United throughout his two and a bit year reign at the club. He's never looked like he belongs at the Theatre of Dreams since being appointed as manager in May 2016. Back then, United fans were clambering for Mourinho to be the manager of United as they'd probably take just about anyone, as long as Louis Van Gaal left the club. Unfortunately, this has very much been a case of be careful what you wish for. If the club's board had stepped back and exercised a little patience, they would have realised that Mourinho was never going to be suit United. Perhaps United fans have been spoiled by the feast of attacking football served up by Sir Alex Ferguson, but there is an expectation (even a demand) that United play attractive, attacking football. They were never going to get that by hiring Mourinho: an ultra pragmatist who wins trophies based on defensive solidarity and grinding out results. With the exception of his Real Madrid side, it's hard to recall any Mourinho side playing attacking football. Essentially, United were getting an upgraded version of Louis Van Gaal and so it's proved. Therein lied the problem- United were hiring a manger who wanted to do things his way and not uphold the club traditions. United is one of the biggest clubs in the world and is much bigger than one man or player, something which Sir Alex understood. However, Mourinho (just like Van Gaal) has failed to understand the importance of playing attacking football. He's never really connected with fans or understood the 'United' way. In fairness, Mourinho has undoubtedly improved the club's fortunes since Van Gaal left, with a League Cup, Europa League and a 2nd placed league finish to his credit. He's made some solid (but not great) signings in Ibrahimovic, Lukaku, Pogba and Matic. However, that has been offset by a series of stale performances with no attacking intent or quality. Attacking displays have been at a premium- these days United's football is very predictable: slow, one-dimensional with the plan B of playing long balls up to Fellaini. Even though Mourinho has a great reputation for creating sides with great defences, some of the defending in the last couple of games against Tottenham and Brighton has been appalling. Just like there was under Van Gaal, there's been plenty of embarrassing defeats added to the mix as well. Last season, United lost to Huddersfield, Newcastle, Brighton, West Brom, Basel and Bristol City. Such a set of results would have been inconceivable to Sir Alex. Fergie might have had the occasional bad result, but he never lost to three promoted sides in the same season (Mourinho became the first United boss in the Premier League to suffer such an ignominy). There were also plenty of games that United should have won but drew, because of a lack of attacking efficiency and quality. It's clear that Mourinho has taken United as far as he can and that it's time for him to leave. The longer he stays at United, the uglier it's going to get. He was never the right manager for United in the first place. Where did it go wrong for Jose Mourinho at Manchester United?